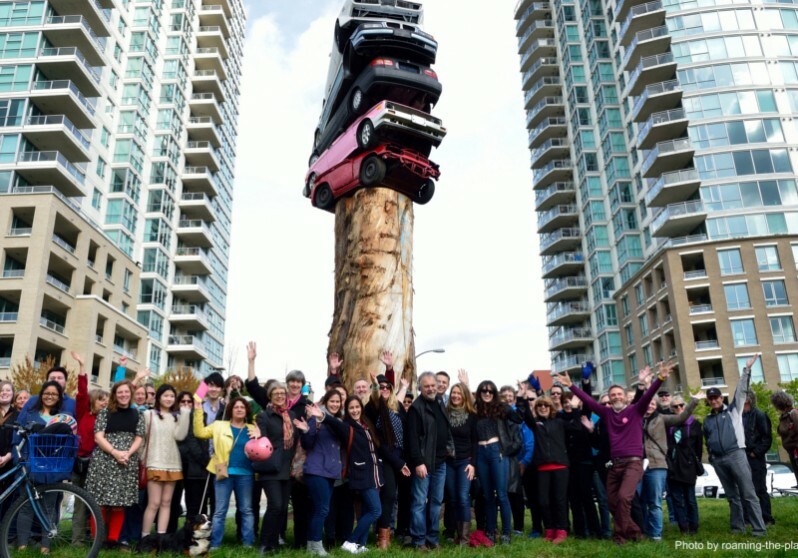 This artwork is a legacy of the 2014-2016 Vancouver Biennale thanks to a generous donation from Chip and Shannon Wilson. 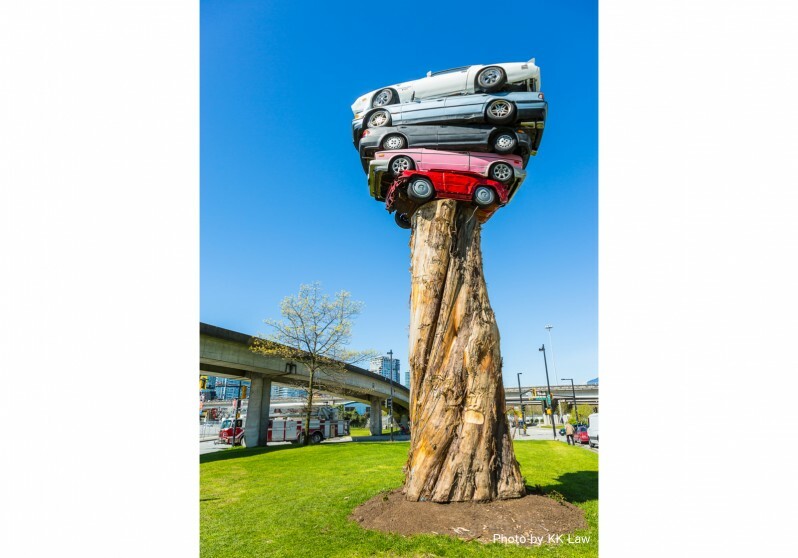 Marcus Bowcott is a Vancouver-based artist working in painting and sculpture. 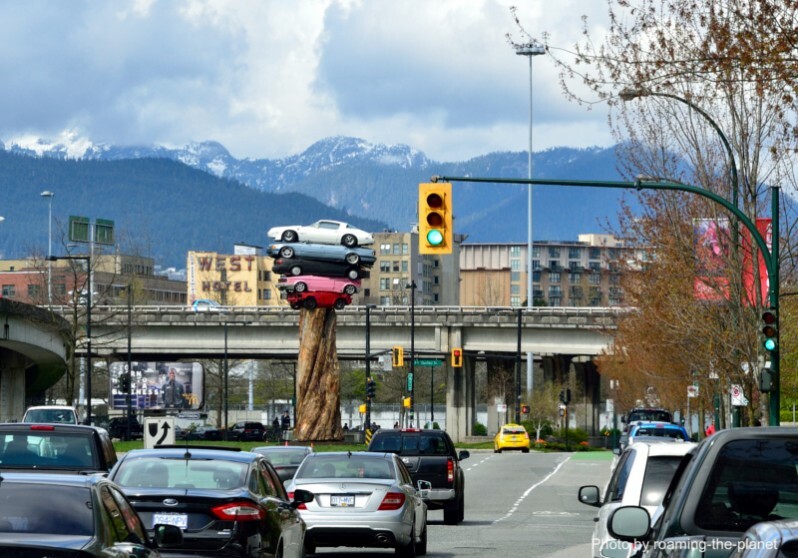 Trans Am Totem is a 10-meter-high (33-foot), 11,340-kilogram (25,000-pound) sculpture, located at Quebec Street and Milross Avenue. 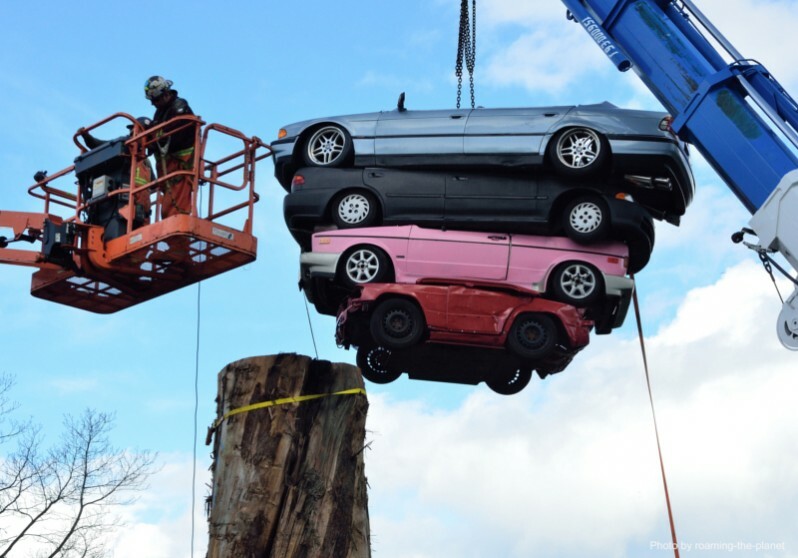 It is composed of five real scrap cars stacked upon an old growth cedar tree. 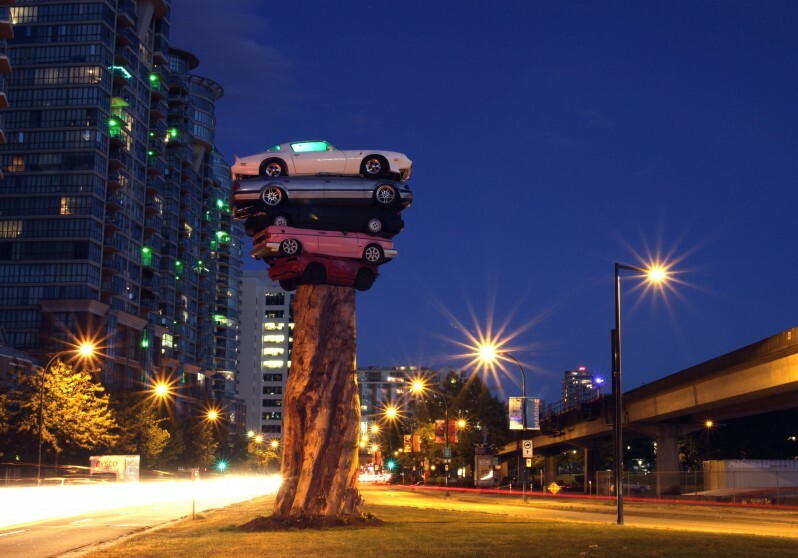 The artwork considers our consumer “out with the old, in with the new” culture in relation to the site, its history, and Vancouver’s evolving identity. In his artworks Marcus Bowcott arranges what remains of our throw-away consumer culture. As a metaphor, his work uncovers an unpleasant darkness in our society, revealing the emotional bankruptcy that results from our dependence on cheap consumer goods which are almost always produced by unseen people on other continents. His beautifully twisting sculptures attempt to find something redeeming in the detritus remaining from cycles of consumer desire and planned obsolescence. 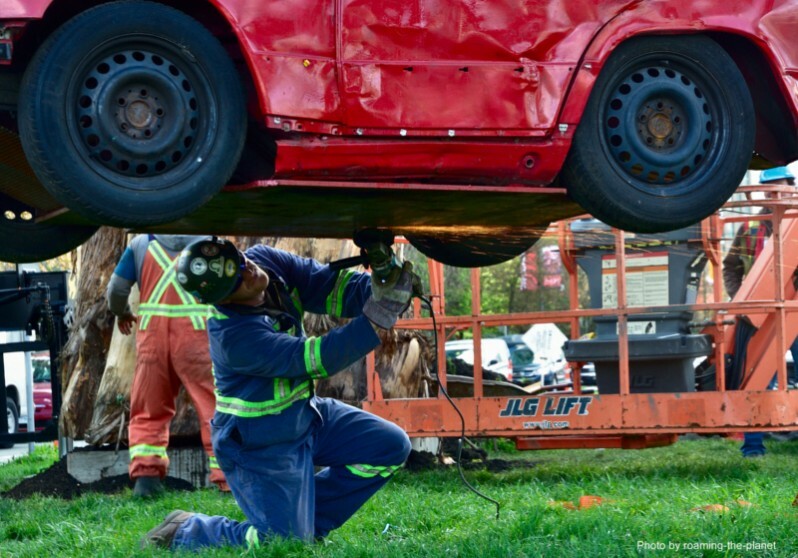 By stacking smashed automobiles and levitating them high above the roadway, Bowcott serves to remind us of the ultimate responsibilities we bear to our planet and future generations. Trans Am Totem fantasizes a justified end to car culture even as countless automobiles zoom past on asphalt and concrete ribbons and ooze pollutants and spent carbon fuels into the atmosphere. The artist’s vision of Nature triumphant subversively reminds us ultimately of our ongoing contributions to global warming and further environmental degradation. Before the introduction of heavy industry, this site was a shoreline of tidal flats and massive forest with old-growth cedars and Douglas Firs in the vicinity of Musqueam, Squamish, and Tsleil-Waututh Nations. 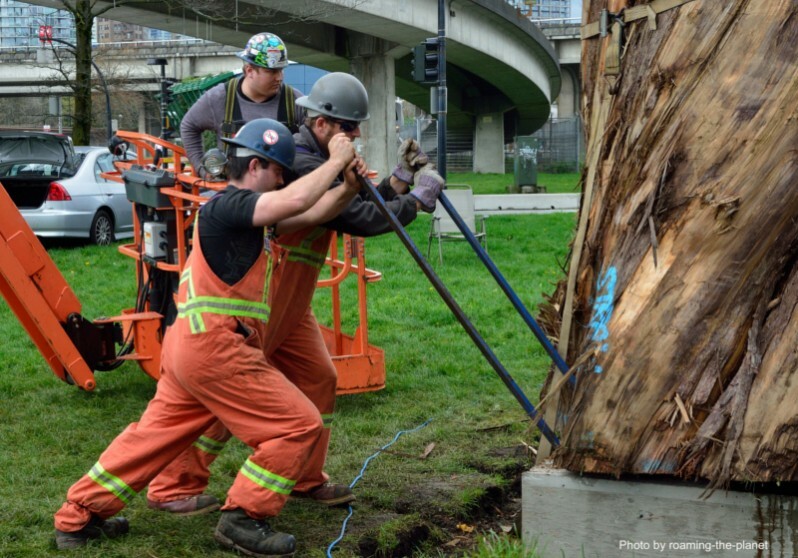 Later, the False Creek neighbourhood became an industrial zone of sawmills and beehive burners, ringed with ever-increasing collections of log booms. Just before Expo ’86 the mills were removed, and the area transformed. 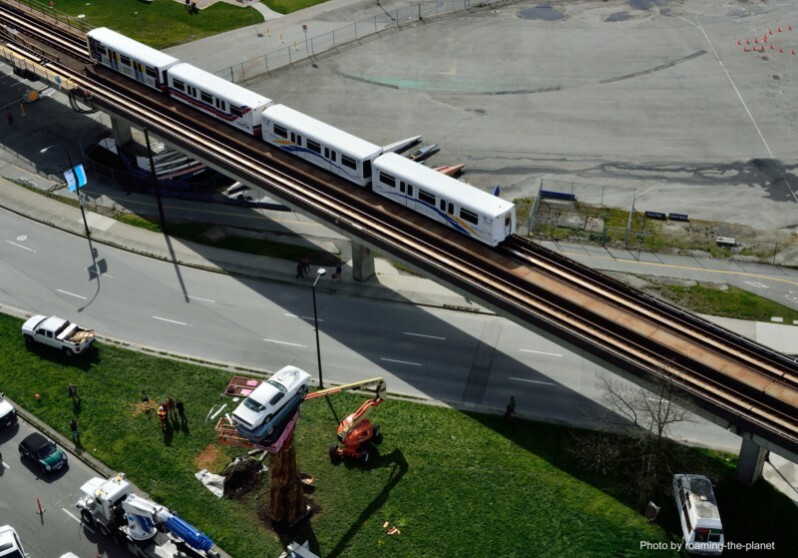 Now the neighbourhood is a constant flow of transportation and interconnections: residential tower blocks, commercial business, and entertainment centers encircled by cyclists, light rail, and, most dominant of all, cars.